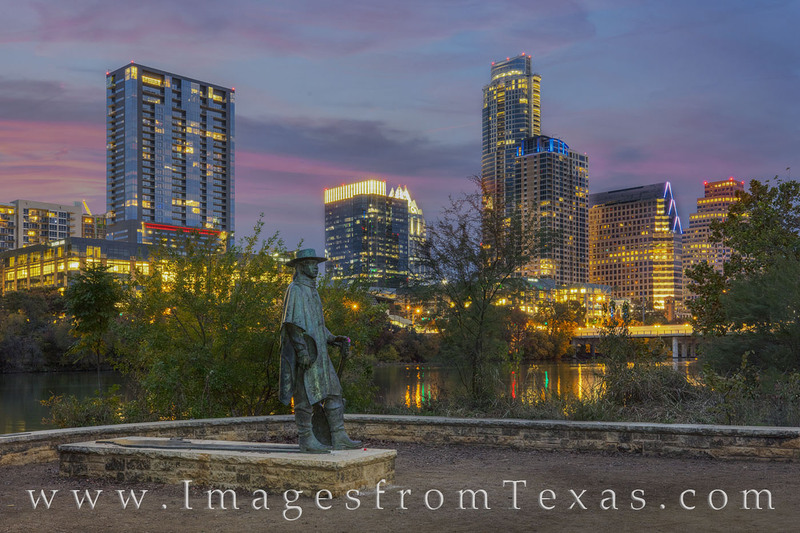 From one of the most iconic locations along the Zilker Park Hike and Bike Trail, this is the SRV (Stevie Ray Vaughan) statue with the Austin skyline rising in the distance. The night lights were on as the colors of the sky slowly dimmed on a beautiful November evening. The statue honors the late guitarist and local folk hero and was constructed in 1994. The figure has become a tourist attraction and flowers are often left at its base as folks pay tribute to Stevie. Photo © copyright by Rob Greebon.